I love to find new and interesting ways to wear scarves for the beautiful pop of colors. A gal just can't go out and find a top that offers this type of print and colors. 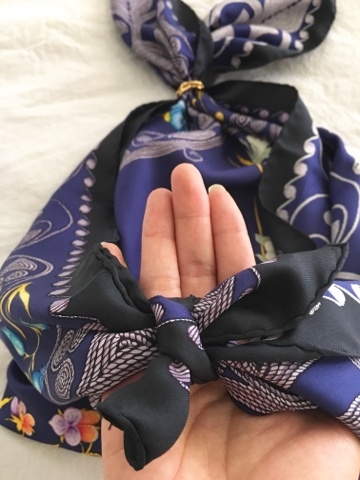 Since Hermes scarves are pricey, I try to find various ways to use it to bring the cost per wear down. 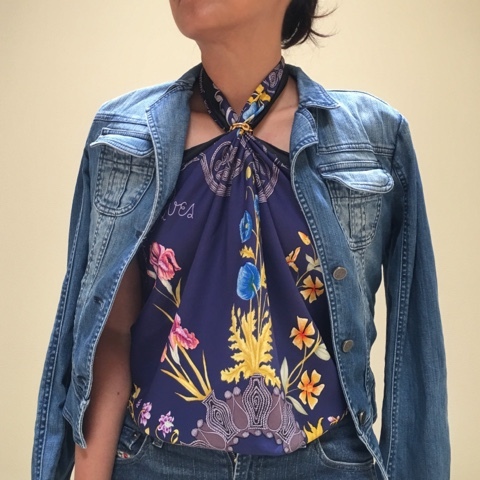 One of my favorite mode is to wear it as a halter top in the summer or under a jacket during cooler months. Recently I am also into denim on denim which in my younger days would be a total faux pas. Again never say never as I am adoring mom jeans now too. These are just so comfortable. I don't care if tot tug and pull at me, I know my jeans are safe and snug. -The scarf should be at least 35 inch. The bigger the scarf, the longer you will be able to wear it. At 35 inch, the top will tie around my natural waist. A gal with longer torso or a taller gal may need a larger scarf if desire more coverage. 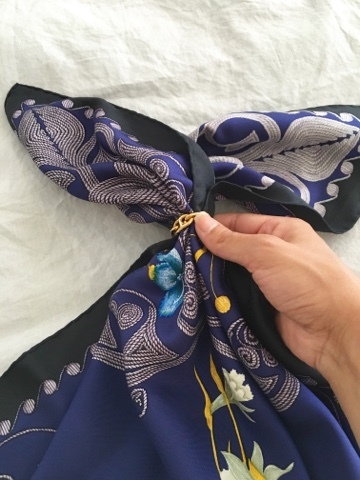 -Take the two end and tie a secure knot around the back. I can't wait to try other modes. How do you like to wear your scarf?